This entry was posted on Thursday, August 7th, 2014 at 10:58 am and is filed under 17th Street SE, Barney Circle, Penn East, Transportation. You can follow any responses to this entry through the RSS 2.0 feed. You can leave a response, or trackback from your own site. The A1 and A2 concepts look very promising. I like the development potential to extend the neighborhood and help bridge the gap and tracks between the neighborhood and the river. This site has great potential to build near a metro station and use the urban fabric to help heal the wound in the cityscape that the freeway left when it was built. Additionally, I would imagine that the infrastructure proposed here won’t be cheap, using development to help finance the cost of extending the grid and bridging the railroad tracks and connecting to the river is an attractive option. I, for one, don’t love the idea of more green space, because I think it too easily turns into green space for the sake of green space. The presentation cites the example of the GW Parkway; lovely green space to look at while you’re driving through, but that’s not really a great asset for the people living next door. Not all green space is created equal, and none of the options presented here are particularly compelling to me. The real benefits will come from connecting the city to the waterfront, and making making it easier for the people to make use of the space that is already there. For the development options, I do like the ones that show new development around the Southwestern portion of Barney Circle. That’s a great opportunity to ‘enclose’ the circle a bit and better define that space. Combine that with a redesign of the roadways and of the circle’s greenspace itself, and I think that’s a winning option. On the two-lane vs. four-lane discussion, I can totally understand the two-lane desire. At the same time, perhaps the eventual plan will combine both desires, with two two-lane options to better reconnect the entire grid and help spread traffic out across all the streets. ANC 6B deserves an award for its initiative to improve the SE Blvd options for the neighborhood. This is a huge accomplishment. One key goal is preserving quality of life for people living on L Street, SE, including not subjecting those residents to the noise, vibration, and air pollution from a two-lane road running next to their front yards. 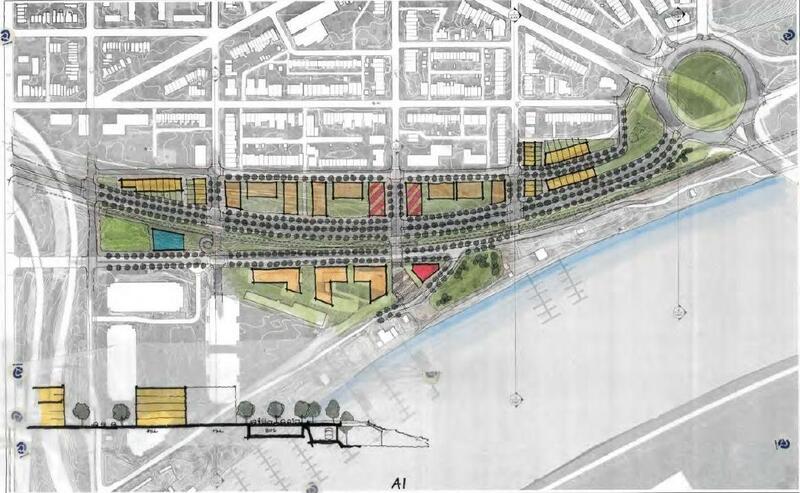 C-2, if it contained a meaningful amount of green space, and pedestrian access to M Street and the river, is the best option – and there would be no road next to L Street, SE. It was very helpful to learn that cost constraints may limit, perhaps drastically, how much green space would be feasible. If in the end, C-2 yields two or three elevated pedestrian paths over the SE Blvd, and not much more green space, this would be a disappointment, but might be better than A-1, A-2 or B-1. At least there would be a pedestrian connection to M Street and the river. 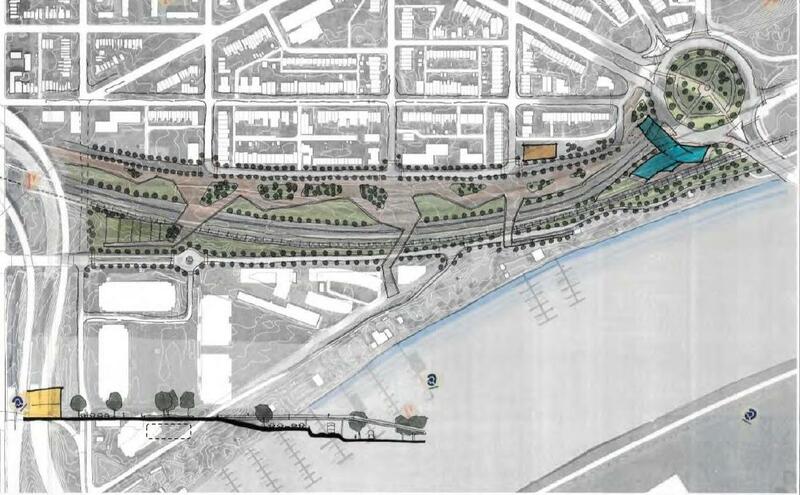 The Anacostia Riverwalk already runs next to Boathouse Row, contrary to one statement made at the August 4 meeting. DDOT appears very interested in air-rights development and in “platform parks.” See www. districtsource.com, ” Park Space Proposal Above Connecticut Avenue,” (park over the 1500 and 1600 blocks of Connecticut Avenue), “Mount Vernon Air Rights, Lots Up for Grabs,” and other air-rights projects described on the website. DDOT should be able to provide estimates of the cost for C-2. A-2, with new rowhouses immediately across L Street from existing houses, and the westbound two-lane road next to the new rowhouses, has promise. People living on L Street would lose some of their view, but would be spared the two-lane road next to their houses. The new rowhouses could be engineered to better withstand the road vibration and noise (e.g., sound insulation), and should be able to offer underground parking. A big concern with A-1 or A-2 is zoning. It should be very easy to transform A-1 or A-2 into an air-rights project, and maybe a large one. As we know, the Akridge air-rights project at Union Station will be a 14-acre building. DMPED or OP may want higher density development as an incentive to pay for the infrastructure needed for A-1 or A-2, or a hybrid of A, B, or C. If A-1 or A-2 is selected, it will be critical to know how the area is zoned now (or if it is zoned at all), and how it would be zoned going forward. The time-line of this project and the election cycle complicate getting an enforceable commitment on zoning. B-1 is the worst option for the neighborhood, with a two-lane road installed in front of L Street houses. Ken Jarboe made an excellent point about finding out why DuPont Circle is pedestrian-accessible, but Washington Circle much less so. I have crossed both of them on foot this year, and agree with his assessment. If Barney Circle could become pedestrian-accessible, it could become a neighborhood gathering place. People are drawn to fountains, and a large fountain at Barney Circle would be wonderful if properly maintained. Combining a fountain with a monument might make it Barney Circle eligible for maintenance by NPS. (What we don’t want is a water feature like the one on the 900 block of G Street, NW, in front of the library, that was not maintained, dried up, became a nuisance, and was demolished.) A refreshment stand, and maybe a beer garden, might be considered. A children’s play space would be a good idea, and open space to throw a football. First I want to echo what Beth said above. No matter than outcome ANC6B as a whole and especially the transportation committee deserves a huge applause for the work not letting DDOT push forward with rebuilding the freeway and adding surface parking without a fight. As for the specifics, I think concept B1 is the perfect compromise for green space and development. Having a four block park with a similar width to Marion Park in this part of Hill East would be great. It adds low density residential which is actually less intensive than the current R-5-B zoning on L Street. Turning L Street from what is essentially a cul-de-sac to a normal street of course will get some pushback, but in my mind looking at B1 I think of the north and south side of Lincoln Park. Raised crosswalks. Narrow lanes. Stop lights. Super low speed. The traffic from North Carolina and Massachusetts hardly are a deterrent to those being some of the most sought after blocks in the city. With the right engineering at Barney Circle and every intersection, it could be a lovely road on both sides of the park. Concept C2 is basically a prettier version of DDOT’s initial freeway replacement concept 4B, but replacing the parking lot with some semblance of park space. There are of course plenty of pluses to replacing the freeway below the grade of L street and those shouldn’t be discounted. But it also means we would throw away one of the few opportunities the community has had to simply add more city to the city. Concept A1 is what I would want in an ideal world. Extending the existing R-5-B zoning to most of the new development area and adding small amount of mixed-use at the corners with 14th street. It Puts the boulevard traffic away from existing development. It really is the best option for the city and to me the best option for the residents of Hil East/Capitol Hill. One additional thing about the specific proposals. As a resident of 14th Street, I just want to say I fully support turning 14th street into the major pedestrian connection between the metro, any new mixed-use development near the boulevard, the Cohen project at 1333 M, and the river. My main non-specific concern continues to be the role of the FHWA and their money in this. I hope this entire exercise isn’t pointless. At the next meeting I want Councilmember Wells to really shine some light on the disposition process that would be needed and both the fiscal and time costs associated with it. And how much money exactly the FHWA providing and whether we can offset that with development rights on SE Blvd combined with PUD money from the Cohen Companies. Completely agree with Alex B – concepts A1 and A2 are the best concepts. Connect the grid, develop the new roads with housing with higher density along the “boulevard,” and save the green space for the river. Let’s make this happen. 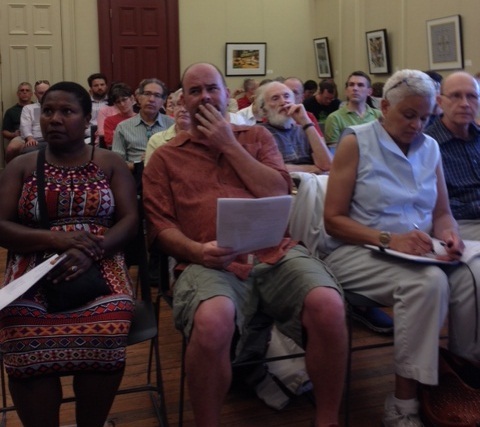 My husband and I were at the meeting on August 4th when all of us present were told that DDOT were going to start rebuilding the South East Expressway (temporarily) in exactly the same space as it was previously. You should all be away that that is not what is happening. They are currently building the East West lane on the upper level that has been covered in dirt the last several years. While that might be an improvement visually from what we have had, we are fearful that by doing this DDOT might then be considering using the old LOWER lanes for bus parking. We noticed in all of the Office of Planning presentation concepts, that the lower level had been left empty – probably space for bus parking. PLEASE don’t tell us that that is what is really happening right in front of eyes. Thanks for the comment and for attending the Aug. 4 meeting. All of the concepts include a street that is above the level of the old freeway. And DDOT needs to raise the grade of the old freeway between 11th & 12th Streets SE so that the boulevard connects directly to the new freeway ramps at 11th Street. There are no plans in the short term for bus parking under this rebuilt portion of the freeway, though DDOT would like the idea to remain under consideration in the planning and transportation studies. It’s my understanding that the concepts proposed here were designed to demonstrate certain design ideas that could eventually be incorporated into a final set of constructions option. That being said, I really like the idea of a *combination* of green space and development. I would like to see one of the blocks here set aside for a park — perhaps the block between 13th and 14th street — with a fountain and playground. 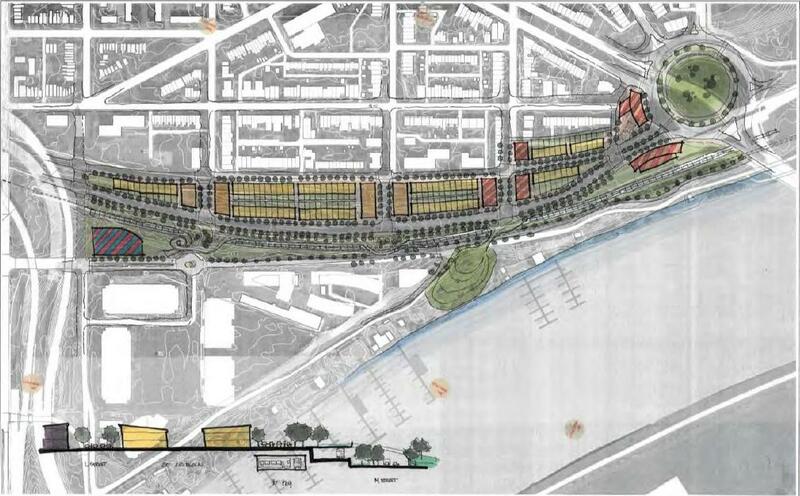 It could function as a local community square for the Boathouse Row residents and the neighborhood south of Penn Ave. The rest of the space can be developed, either with rowhouses or smaller apartment buildings. I agree that a park on the river would be great, but there are no active plans for any parks there. Although the Cohen Companies development at 1333 M Street will include some green space it will be more geared toward beautification of the apartment complex for the renters and less appropriate for a children’s playground or other community uses. 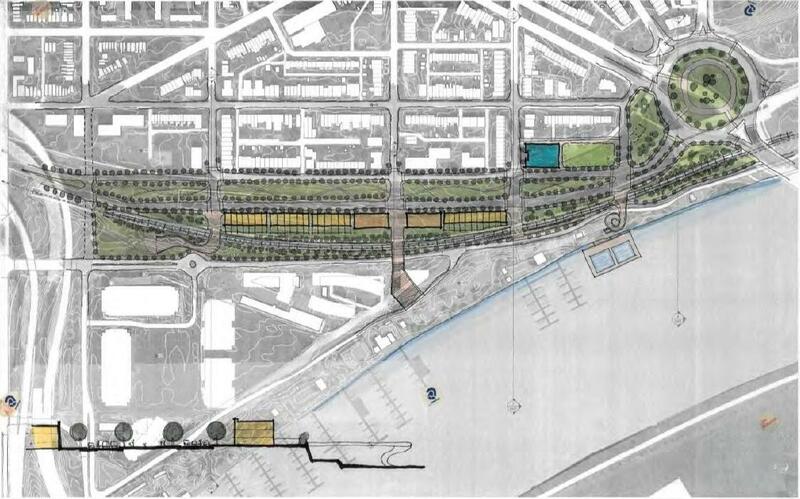 I would also re-emphasize the need to keep the boulevard off L Street, and to build direct connections to the waterfront. I for one am happy about re-opening the freeway, at least for now. A large number of neighborhood residents like myself, need to have some kind of access to the SE-SW freeway, especially since the on-ramp at 11th Street was removed. Limiting access to the freeway turns the entire neighborhood into an on-ramp: Check out the line of cars every morning extending from 3rd street down Virginia/Eye Street all the way to 14th. I say get the cars off the neighborhood streets and onto the arterials and freeway where the belong. Obviously this is a temporary solution but I appreciate having the extra 20-30 minutes with my family instead of slogging through Capitol Hill traffic on surface streets. As for the plan, I agree with Frank that a park in the area sounds great, assuming it offers some real amenities as a park and people in the surrounding blocks have access to it. Otherwise, DC has too much useless drive-by “green space” as it is. The most important thing, though, is managing traffic. The boulevard needs to be able to move cars out of the neighborhood and a 2-lane road is not going to cut it. There are plenty of ways to accommodate an arterial without just rebuilding the freeway. But let’s not assume that putting in a 2-lane road with speed bumps is going to keep the traffic away. Traffic will continue to be a nightmare and people who need to get somewhere will just tear through the adjacent streets. Thanks for the comment Chris. I agree that we should be working to keep commuters on the freeway and off of neighborhood streets. Unfortunately, reopening this segment of the freeway is just going to attract more commuters to and through the neighborhood. When I-295 backs up, commuters are going to exit at E. Cap and take 17th Street SE south to the reopened freeway segment. When 17th Street inevitably backs up, cars are going to turn down Potomac of other side streets to get to I Street and eventually the 11th Street or 3rd Street on-ramps. Reopening the freeway just exacerbates the neighborhood traffic problem. It seems to me that all the designs are moot with the “temporary” re-opening of the freeway. The questions is, what are we willing to do as a community about it, before it becomes a fait accompli? Thanks for the comment. See my new post. This appears to be loaded language that says nothing about how the freeway is so separated- as if there should not be a separated roadway- a philosophy that applied to say transit would use the example of the Chinese wall Red Line as an “argument” against subways. We already have the basic prototype of the pair of tunnels beneath Barney Circle. Extending that with or without some new development alongside or atop, and with an extension over the adjacent railway would go furthest for providing benefit to the greatest numbers of people. So constructing a tunnel box atop the existing highway and railway is by far the best bang for the buck in providing a modern underground facility, with no new excavation (which is generally the largest cost with underground roadways). Also the tunnel box must include a terraced transition to the water. To throw away the freeway would be a complete waste simply for an out modeled dogma that would have thwarted building the underground portions of Metro.